Paul Erdõs, one of the greatest mathematicians of the twentieth century, and certainly the most eccentric, was internationally recognized as a prodigy by age seventeen. Hungarian-born Erdõs believed that the meaning of life was to prove and conjecture. His work in the United States and all over the world has earned him the titles of the century's leading number theorist and the most prolific mathematician who ever lived. Erdõs's important work has proved pivotal to the development of computer science, and his unique personality makes him an unforgettable character in the world of mathematics. Incapable of the smallest of household tasks and having no permanent home or job, he was sustained by the generosity of colleagues and by his own belief in the beauty of numbers. Witty and filled with the sort of mathematical puzzles that intrigued Erdõs and continue to fascinate mathematicians today, My Brain Is Open is the story of this strange genius and a journey in his footsteps through the world of mathematics, where universal truths await discovery like hidden treasures and where brilliant proofs are poetry. The call might come at midnight or an hour before dawn -- mathematicians are oddly unable to handle the arithmetic of time zones. Typically, a thickly accented voice on the other end of the line would abruptly begin: "I am calling from Berlin. I want to speak to Erdõs." "Why don't you know?" Click! Neither are mathematicians always observant of the social graces. For more than sixty years mathematicians around the world have been roused from their abstract dreams by such calls, the first of the many disruptions that constituted a visit from Paul Erdõs. The frequency of the calls would increase over the next several days and would culminate with a summons to the airport, where Erdõs himself would appear, a short, frail man in a shapeless old suit, clutching two small suitcases that contained all of his worldly possessions. Stepping off the plane he would announce to the welcoming group of mathematicians, "My brain is open!" 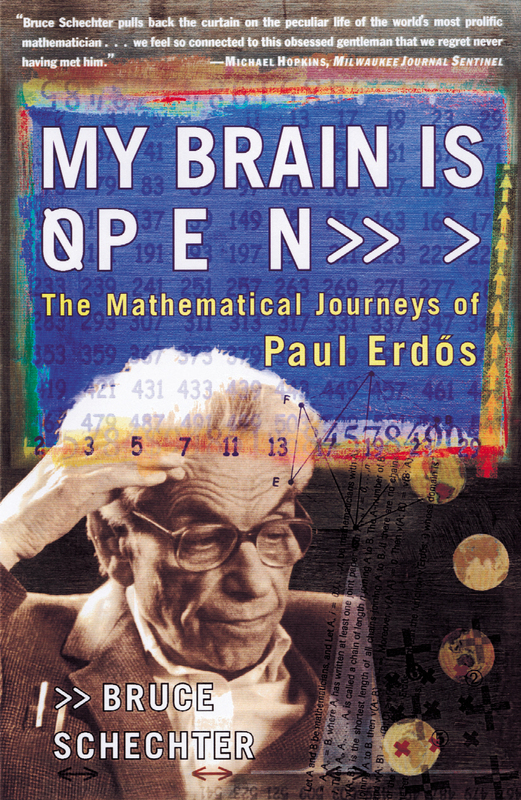 Paul Erdõs's brain, when open, was one of the wonders of the world, an Ali Baba's cave, glittering with mathematical treasures, gems of the most intricate cut and surpassing beauty. Unlike Ali Baba's cave, which was hidden behind a huge stone in a remote desert, Erdõs and his brain were in perpetual motion. He moved between mathematical meetings, universities, and corporate think tanks, logging hundreds of thousands of miles. "Another roof, another proof," as he liked to say. "Want to meet Erdõs?" mathematicians would ask. "Just stay here and wait. He'll show up." Along the way, in borrowed offices, guest bedrooms, and airplane cabins, Erdõs wrote in excess of 1,500 papers, books, and articles, more than any other mathematician who ever lived. Among them are some of the great classics of the twentieth century, papers that opened up entire new fields and became the obsession and inspiration of generations of mathematicians. The meaning of life, Erdõs often said, was to prove and conjecture. Proof and conjecture are the tools with which mathematicians explore the Platonic universe of pure form, a universe that to many of them is as real as the universe in which they must reluctantly make their homes and livings, and far more beautiful. "If numbers aren't beautiful, I don't know what is," Erdõs frequently remarked. And although, like all mathematicians, he was forced to make his home in the temporal world, he rejected worldly encumbrances. He had no place on earth he called home, nothing resembling a conventional year-round, nine-to-five job, and no family in the usual sense of the word. He arranged his life with only one purpose, to spend as many hours a day as possible engaged in the essential, life-affirming business of proof and conjecture. For Erdõs, the mathematics that consumed most of his waking hours was not a solitary pursuit but a social activity, a movable feast. One of the great mathematical discoveries of the twentieth century was the simple equation that two heads are better than one. Ever since Archimedes traced his circles in the sand, mathematicians, for the most part, have labored alone -- that is, until some forgotten soul realized that mathematics could be done anywhere. Only paper and pencil were needed, and those were not strictly essential. A table-cloth would do in a pinch, or the mathematician could carry his equations in his head, like a chessmaster playing blindfolded. Strong coffee, and in Erdõs's case even more powerful stimulants, helped too. Mathematicians began to frequent the coffeehouses of Budapest, Prague, and Paris, which led to the quip often attributed to Erdõs: "A mathematician is a machine for turning coffee into theorems." Increasingly, mathematical papers became the work of two, three, or more collaborators. That radical transformation of how mathematics is created is the result of many factors, not the least of which was the infectious example set by Erdõs. Erdõs had more collaborators than most people have aquaintances. He wrote papers with more than 450 collaborators -- the exact number is still not known, since Erdõs participated in the creation of new mathematics until the last day of his life, and his collaborators are expected to continue writing and publishing for years. The briefest encounter could lead to a publication -- for scores of young mathematicians a publication that could become the cornerstone of their life's work. He would work with anyone who could keep up with him, the famous or the unknown. Having been a child prodigy himself, he was particularly interested in meeting and helping to develop the talents of young mathematicians. Many of the world's leading mathematicians owe their careers to an early meeting with Erdõs. Krishna Alladi, who is now a mathematician at the University of Florida, is one of the many young mathematicians whom Erdõs helped. In 1974, when Alladi was an undergraduate in Madras, India, he began an independent investigation of a certain number theoretic function. His teachers could not help Alladi with his problem, nor could his father, who was a theoretical physicist and head of the Madras Institute of Mathematics. Alladi's father told some of his knowledgeable friends about his son's difficulty, and they suggested that he write to Erdõs. Because Erdõs was constantly on the move, Alladi sent a letter to the Hungarian Academy of Sciences. In an astonishingly short time, Alladi heard from Erdõs, who said he would soon be lecturing in Calcutta. Could Alladi come there to meet him? Unfortunately, Alladi had examinations and could not attend, so he sent his father in his place to present the results of his research. After his father's talk, Alladi recounts, "Erdõs walked up to him and told him in very polite terms that he was not interested in the father but in the son." Determined to meet with the promising young mathematician, Erdõs, who was bound for Australia, rerouted his trip to stop briefly in Madras, which lies about 850 miles south of Calcutta. The Iyers and Iyengars are two Brahmin sects. The Iyers worship Shiva the Destroyer but will also worship in the temples of the Iyengars, who worship only Lord Vishnu, the Protector. Erdõs explained that this was his variation on the poem about Boston and the pecking order among the Lowells, the Cabots, and God. Having put Alladi at ease, Erdõs launched into a discussion of mathematics. Erdõs was so impressed with Alladi, who was applying to graduate schools in the United States, that he wrote a letter on his behalf. Within a month Alladi received the Chancellor's Fellowship at the University of California, Los Angeles. A celebrated magazine article about Erdõs was called "The Man Who Loved Only Numbers." While it is true that Erdõs loved numbers, he loved much more. He loved to talk about history, politics, and almost any other subject. He loved to take long walks and to climb towers, no matter how dismal the prospective view; he loved to play ping-pong, chess, and Go; he loved to perform silly tricks to amuse children and to make sly jokes and thumb his nose at authority. But most of all, Erdõs loved those who loved numbers, mathematicians. He showed that love by opening his pocket as well as his mind. Having no permanent job, Erdõs also had little money, but whatever he had was at the service of others. If he heard of a graduate student who needed money to continue his studies, he would send a check. Whenever he lectured in Madras he would send his fee to the needy widow of the great Indian mathematician Srinivasa Ramanujan; he had never met Ramanujan or his wife, but the beauty of Ramanujan's equations had inspired Erdõs as a young mathematician. In 1984 he won the prestigious Wolf prize, which came with a cash award of $50,000, easily the most money Erdõs had ever received at one time. He gave $30,000 to endow a postdoctoral fellowship in the name of his parents at the Technion in Haifa, Israel, and used the remainder to help relatives, graduate students, and colleagues. "I kept only $720," Erdõs recalled. In the years before the Internet, there was Paul Erdõs. He carried a shopping bag crammed with the latest papers, and his brain was stuffed with the latest gossip as well as an amazing database of the world of mathematics. He knew everybody: what they were interested in; what they had conjectured, proved, or were in the midst of proving; their phone numbers; the names and ages of their wives, children, pets; and much more. He could tell off the top of his head on which page in which obscure Russian journal a theorem similar to the one you were working on was proved in 1922. When he met a mathematician in Warsaw, say, he would immediately take up the conversation where they had left it two years earlier. During the iciest years of the Cold War Erdõs's fame allowed him freely to cross the Iron Curtain, so that he became a vital link between the East and the West. In 1938, with Europe on the brink of war, Erdõs fled to the United States and embarked on his mathematical journeys. This book is the story of those adventures. Because they took Erdõs everywhere mathematics is done, this is also the story of the world of mathematics, a world virtually unknown to outsiders. Today perhaps the only mathematician most people can name is Theodore Kaczynski. The names of Karl Friedrich Gauss, Bernhard Riemann, Georg Cantor, and Leonhard Euler, who are to mathematics what Shakespeare is to literature and Mozart to music, are virtually unknown outside of the worlds of math and science. For all the frequent-flier miles Erdõs collected, his true voyages were journeys of the mind. Erdõs carefully constructed his life to allow himself as much time as possible for those inward journeys, so a true biography of Erdõs should spend almost as much time in the Platonic realm of mathematics as in the real world. For a layman this may seem to be a forbidding prospect. Fortunately, many of the ideas that fascinated Erdõs can be easily grasped by anyone with a modest recollection of high school mathematics. The proofs and conjectures that made Erdõs famous are, of course, far more difficult to follow, but that should not be of much concern to the reader. As Ralph Boas wrote, "Only professional mathematicians learn anything from proofs. Other people learn from explanations." Just as it is not necessary to understand how Glenn Gould fingers a difficult passage to be dazzled by his performance of the "Goldberg Variations," one does not have to understand the details of Erdõs's elegant proofs to appreciate the beauty of his mathematics. And it is the nature of Erdõs's work that while his proofs are difficult, the questions he asks can be quite easy to understand. Erdõs often offered money for the solution to problems he proposed. Some of those problems are easy enough for readers of this book to understand -- and perhaps even solve. Those who decide to try should be warned that, as Erdõs has pointed out, when the number of hours it takes to solve one of his problems is taken into account, the cash prizes rarely exceed minimum wage. The true prize is to share in the joy that Erdõs knew so well, joy in understanding a page of the eternal book of mathematics. Michael Hopkins Milwaukee Journal Sentinel Bruce Schechter pulls back the curtain on the peculiar life of the world's most prolific mathematician....We feel so connected to this obsessed gentleman that we regret never having met him. Paul Erdõs If numbers aren't beautiful, I don't know what is. K.C. Cole author of The Universe and the Teacup: The Mathematics of Truth and Beauty With affection, insight, and humor, Bruce Schechter invites us into the wacky world of mathematical genius Paul Erdõs -- one of the strangest characters to inhabit the world of science. Schechter does an admirably agile job of interweaving real mathematics with the far side of human nature. Russ Cardwell The Post and Courier (Charleston, SC) My Brain Is Open is a lively romp through Erdõs' globe-trotting life and into the surreal, exclusive club of the world's great mathematicians. Doug Wyatt Savannah Morning News Schechter, with insight, considerable affection, and high humor, admirably intertwines accounts of [Erdõs's] bizarre life with an appreciation of his remarkable achievements.